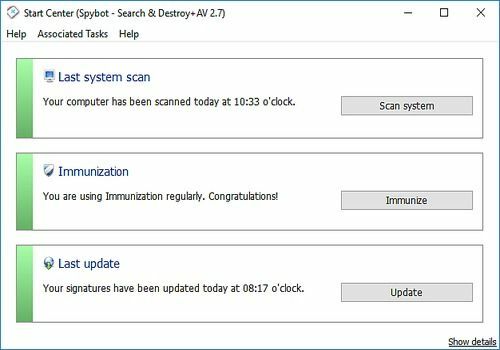 Known as one of the most powerful programs to eliminate threats on your computer, Spybot Search and Destroy has almost nothing left to prove. Indeed, its technology allows it to detect all kinds of threats such as adware, spyware or keyloggers thanks to the regular updating of its database, i.e. at least once a week. You then have access to its "vaccinate" button which allows you to analyze your machine in search of different threats. If you are in a hurry, a quick scan will suffice to scan the most dangerous areas of your machine. On the other hand, if you have more time, Spybot Search and Destroy will carefully analyze every corner of your machine. The software adapts to your knowledge. The classic mode includes basic options that allow novice users to easily clean their computer. But Spybot Search and Destroy also includes an advanced mode with many more settings to perform specific tasks. The latest versions of this product also support most browsers in their analyses.